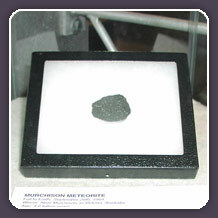 A fragment of the Murchison meteorite on display in the United States. Scientists continue to study meteorites like Murchison in hopes they'll be able to unlock their celestial secrets. The public, too, continues to be fascinated. For an up-close look, pieces of the Murchison meteorite can be viewed at the Museum of Victoria, Australia, the Smithsonian Institution in Washington DC and the Field Museum of Natural History in Chicago. You can also visit Meteorite Park in Murchison, Australia.